I hope you are having a smashing week. I love looking through all the links each week, and last week was no exception! If you like to EAT, you have got to check out the food section from last week’s party. TONS of yummy stuff! Classy Clutter made over a headboard and it is looking mighty fine if I do say so myself. 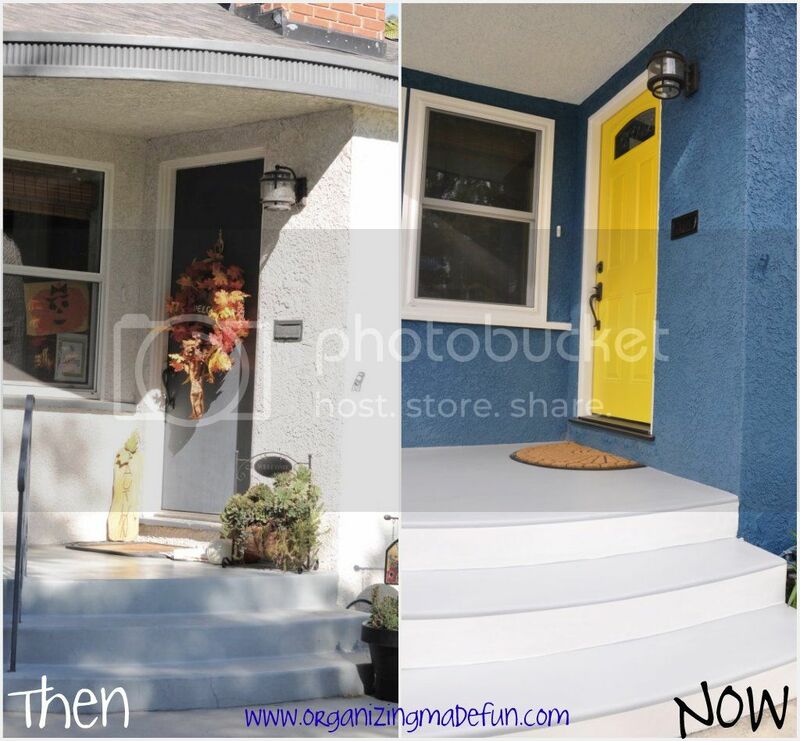 Organizing Made Fun gave her house and door a fresh new look. Talk about curb appeal! The Shafer Family found some disgusting lamps at goodwill, but after a little cleaning they are amazing. Great chair makeover by Thrifty & Chic! 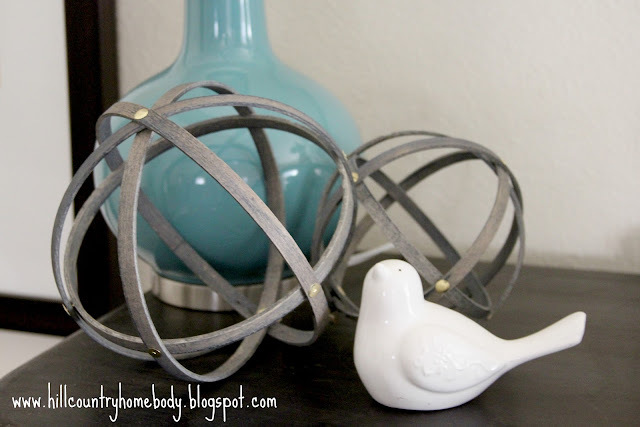 Hill Country Homebody knocked off some West Elm spheres, and she did a fab job. Such a pretty scarf-turned-shirt makeover from Potholes and Pantyhose. Teal and Lime got creative with washi tape by adding it to the inside of her lampshade. Lovin’ the look. Inspired Honey Bee made her own driftwood star. I love stars, and I really love this piece! Passionately Perfect! 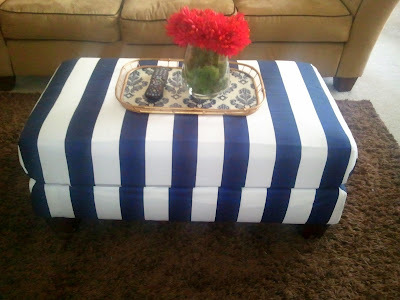 recovered her ottoman with some fun striped fabric. Five Days, Five Ways was inspired by Anthropologie’s kitschy candlesticks and made some of her own. Wow, this peanut butter ball with graham crackers looks so delicious. Check out the recipe over at Mostly Food and Crafts. Makoodle swears these are THE BEST SUGAR COOKIES EVER. I’m trusting her on this one and will most definitely be making up a batch of these. Great features, Allison! Those lamps are amazing! Thanks for hosting! What great features! Those cookies are amazing and I am in love with the lamps. Thanks for hosting the party! Thank you so much for the party! I love all of the features! love the features so I’m totally jealous of those lamps thanks for the party! Thanks so much for featuring my Scarf Shirt! You are so sweet and you made my day/night! Thank you so much for including my washi tape project in the features this week. This is one of my can’t miss link parties. Awesome features! Thank you so much for hosting! Aw Shucks! Thanks for featuring our front entry…doesn’t it just make you smile? These were all great features! Thanks for hosting each week. Glad to link up! Hi Allison – love the grey spheres and the scarf top! Thanks for hosting the party – I just linked a PB knockoff Love Votive Candle Set. Fairly new to blogging; would love if you dropped by my blog to say hello sometime! Those chocolate ice cream cones do look a little poopish…but, that’s automatically where my brain goes. I’m just filthy minded, I suppose. But I bet that’s why we get along? I linked up a yummy Bread Pudding with Butterscotch Sauce Recipe. It is so dang good. Have a great week! Thanks for featuring my Peanut Butter “Cheese Ball” ! Thanks for hosting another great party, lots of inspiration here! 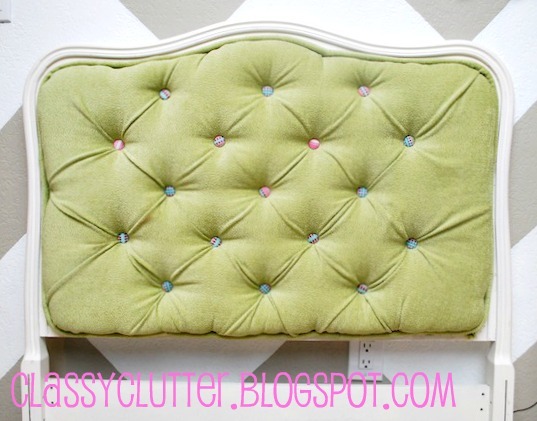 I love that tufted headboard- what a great idea to use multi-colored buttons for the tufting. Linked up a fun v-day party for my girls! A bit of food and fun games and decorations – couldn’t decide where to link it – so it’s under food – #88. Thanks! I love the chair makeover and the grey spheres!! Just linked up a PB Inspired DIY Love Votive Candle Set – so easy and inexpensive! Great features and thank you for the party! Love this! First time link’er. I put mine on both, not realizing there were separate link parties. Will no not to in the future! Thanks for hosting! I am new to your site…love it! I will be your newest follower! Looks like a great party. There are no words for that tufted headboard! I’m a little late to the party, but wanted to link up and mingle. Thanks so much for hosting, Allison! YAY! Thank you so much for the feature! Thanks for another great link-up — love your blog! 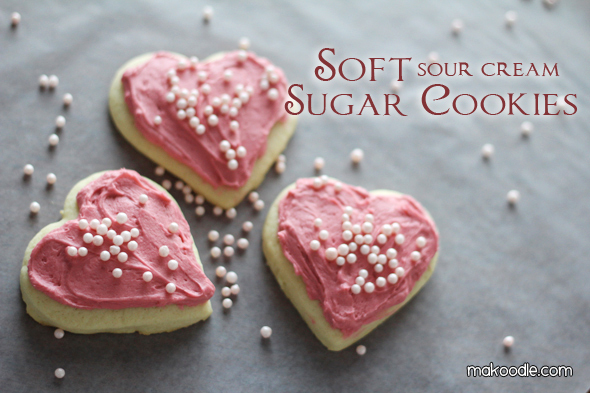 Hope you’ll check out my fun Valentine with free printable this week! Have a GREAT weekend and thanks again for a fab dose of inspiration! Best!! Can I just say….I LOVE YOUR BLOG! One of THE best I’ve read and I couldn’t take myself away. Gonna follow you so I can get all the tips you have listed. Thank you so much for offering so much to us!